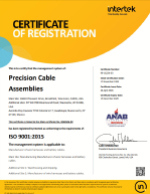 Previously certified as ISO 9001:2008 at all facilities, Precision Cable Assemblies (PCA), has completed the audit process that will update their certifications to the latest version of ISO 9001 which is 9001:2015. Companies that are currently ISO 9001:2008 certified have until September 2018 to become ISO 9001:2015 certified. PCA is beating the rush by completing the certification of their facilities located in Brookfield, Wisconsin, Waukesha, Wisconsin, QingDao City, China and Guadalupe, Mexico. The ISO (International Organization for Standardization) 9001:2015 guidelines are designed to help organizations provide quality products and services to their customers. These guidelines ensure customer satisfaction with a quality management system that meets statutory and regulatory requirements. Upgrading their ISO certification is just another way that Precision Cable Assemblies provides top of the line power distribution components to OEMs. PCA has helped OEMs save time during assembly and provided cost-saving solutions while still meeting the high amperage electrical distribution specifications that are required. Contact Precision Cable Assemblies today for an evaluation of your power distribution requirements.